US Treasury yields extend rally, keeping USD/JPY afloat. Unimpressive data from both economies left speculative interest clueless. 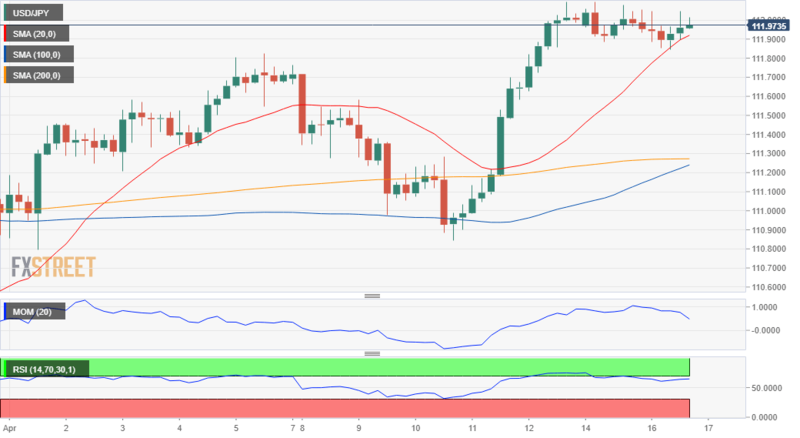 The USD/JPY pair remained confined to a tight range around the 112.00 level, finishing Tuesday a couple of pips below the figure after extending its weekly decline to 111.84. Risk sentiment fluctuated between positive and negative throughout the day, with the pair showing little reaction to it, rather linking its limited directional moves to US Treasury yields' behavior. Strong earnings reports pushed investors away from safe-haven bonds, resulting in yields extending their rallies to fresh 3-week highs, with the yield on the benchmark 10-year note reaching 2.60%. Wall Street pulled off its highs, but Treasury yields held on to gains. Japan release the Tertiary Industry Index for March at the beginning of the day, which resulted in -0.6%, worse than the -0.2% expected. The country will release this Wednesday, March Trade Balance, expected to post a surplus of ¥372.2B. The consolidative phase continues, and the 4 hours chart shows that, despite having lost upward momentum, the downside potential remains limited, as a bullish 20 SMA continues attracting buyers on intraday declines. The RSI indicator in the mentioned chart hovers around 62, while the Momentum has extended its decline down to the 100 level where it turned flat, this last, rather reflecting the absence of progress than suggesting an upcoming decline.